TX1500 Series are discontinued. As an upgrade substitute, please check out the new TXUN temperature transmitter for details. See all TXUN Series. Two-wire Operation Power is obtained directly from the 4 to 20 mA loop, with no need for separate power input. 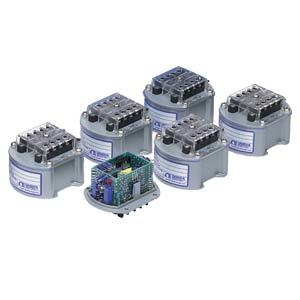 This simplifies field wiring and eliminates the possibility of noise pickup from power lines. Turndown ratio is defined as zero suppression divided by span. The exceptionally high 10:1 turndown ratio possible with the TX1500 Series indicates that wide zero offset can be combined with narrow signal span for closed loop control at high gain. The signal span can also be wide for control of batch operations, where a wide range of signal levels may be encountered over the entire batch cycle. 참고: For Special Options Consult Sales or Temperature Engineering for Availability & Pricing.